Although the Froehde reaction is widely used for alkaloid preliminary identification, there is no reaction mechanism in order to explain the reaction course and the end products. We found there can be two redox steps and we provide a reaction mechanism for both of them and give two routes for the second reaction. 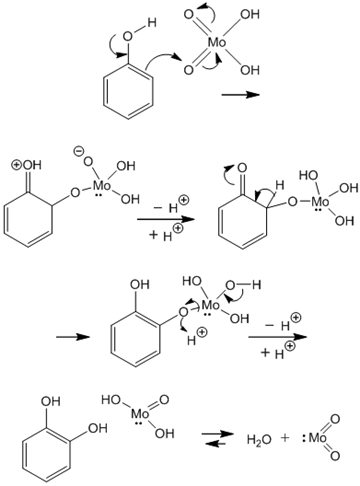 The chemical deportment of the reagent, molybdic acid and its derivatives is also discussed. Sánchez-Viesca, F. and Gómez, R., “On the mechanism of indirubin formation in the Baeyer- Emmerling synthesis”, Am. J. Chem., 8(4), 85-89, 2018. Sánchez-Viesca, F., Berros, M. and Gómez, R., “A complete and sustained Clemmensen reduction mechanism”, Am. J. Chem., 8(1), 8-12, 2018. Sánchez-Viesca, F. and Gómez, R., “Reactivities involved in the Seliwanoff reaction”, Modern Chemistry, 6(1), 1-5, 2018. Sánchez-Viesca, F., Berros, M. and Gómez, R., “On the mechanism of the Baeyer-Drewsen synthesis of indigo”, Am. J. Chem., 6(1), 18-22, 2016. Sánchez-Viesca, F. and Gómez, R., “On the regiochemistry in the Heyns rearrangement”, Am. J. Chem., 5(3), 86-89, 2015. Pesez, M. and Poirier, P., Méthodes et réactions de l’analyse organique, Masson, Paris, 1954, vol. 3, 9. Froehde reagent, https://www.revolvy.com/page/Froehde-reagent accessed: December 29, 2018. Brown, D. A., Comparative inorganic chemistry, McGraw-Hill, London, 1967, 23. Molybdic acid, PubChem Open Chemistry Data Base, CID 82208 accessed: December 29, 2018. Bruni, G., Química inorganica, 12a. ed., UTEHA, México, 1964, 367. Duffy, J. A., General inorganic chemistry, Longmans, London, 1966, 224-225. Bruylants, A., Jungers, J. C., Verhulst, J., Química general, vol. 2, Química mineral, Teide, Barcelona, 1965, 261. Remy, H., Treatise on inorganic chemistry, Elsevier, Amsterdam, 1963, vol. 2, 170. Froehde reagent, https://en.wikipedia.org/wiki/Froehde_reagent Accessed: December 29, 2018. A. Froehde, “Sur la recherche de la morphine”, Bull. Soc. Chim. Paris, 8(1), 166, 1867. (Gallica, BnF). Luder, W. F. and Zuffanti, S., The electronic theory of acids and bases, 2nd. ed., Dover, New York, 1961, 71-72. The molybdenum(IV) oxide, datasheets.scbt.com/sc-235882.pdf. Accessed: December 29, 2018. Shriner, R. L., Fuson, R. C. and Curtin, D. Y., The systematic identification of organic compounds, 4th. ed., J. Wiley, New York, 1958, 116-117. Wild, F., Characterization of organic compounds, 2nd ed. Cambridge University Press, Cambridge, 1960, 102-103. Pesez, M. and Poirier, P., Méthodes et réactions de l’analyse organique, Masson, Paris, 1954, vol. 3, 227. Miall, S. and Mackenzie Miall, L., Diccionario de química, 2ª. ed., Ed. Atlante, México, 1953, 515.